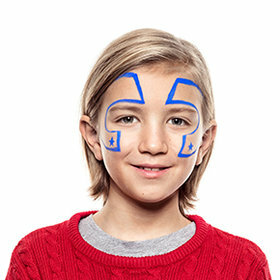 Use your blue Brush Pen to start painting the outlines and stars of the superhero mask around the eyes. Try and make them look like two reflected ‘C’ shapes No need for special powers, Snazaroo Brush Pens make details easy. 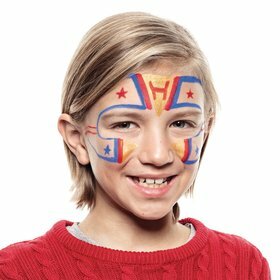 Now take your gold Brush Pen and paint a triangle pointing downwards on the forehead between the two ‘C’ shapes above the eyes, and add a couple more gold triangles where they end on either side of the nose. When the gold paint is dry, it’s time for some finishing touches. With your red Brush Pen, add the final details that will really bring your superhero to life. 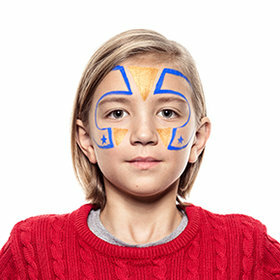 Paint stars and stripes around your blue and gold lines to make a mighty mask with minimum mess. 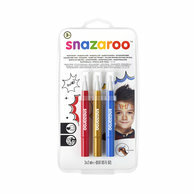 Boldly grab the Snazaroo Adventure Brush Pen Pack with red, gold and blue and brush up on everything from pirates to superheroes. The nib is perfect for outlines and small designs as well as for larger coverage.